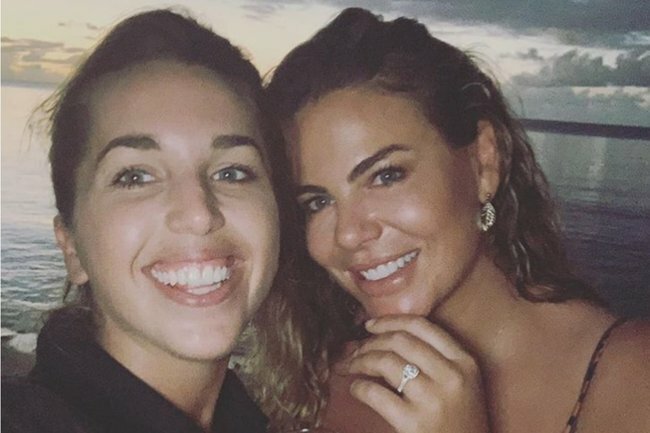 Former Biggest Loser host Fiona Falkiner is engaged to her girlfriend. Model and former Biggest Loser host Fiona Falkiner and her partner Channel Nine reporter Hayley Willis have announced their engagement on Instagram. The pair appear to have been dating for around eight months. “They have been trying to keep it as quiet as possible so they could enjoy getting to know each other without the public glare,” a source told Woman’s Day in February. Speaking of dating, here’s our first date with Sam Wood. Post continues after video. Hayley proposed while the couple were holidaying in Vanuatu. “I can’t wait to spend the rest of my life with you Fee,” Hayley wrote on Instagram. “To everyone who made this incredibly perfect moment possible – our friends @the_moso_life for helping me plan it, our chef turned videographer who captured it perfectly, and to the locals who set off fireworks as we came back to the resort. “Thank you so much, I am forever grateful,” she said. Fiona’s Instagram post simply said: “She asked, and I said yes!” accompanied by a photo of the couple beaming. She asked and I said yes! ????????‍♀️???????? Fiona split from long term partner personal trainer Lara Creber in April last year.